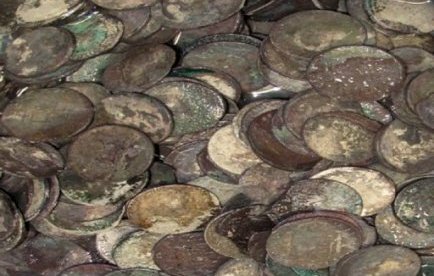 SUISSE – Füllinsdorf - Un trésor composé de 293 pièces de monnaie celte en argent a été découvert à Füllinsdorf, dans le canton de Bâle (nord-ouest), a annoncé jeudi le service cantonal d'archéologie. Pour le chef du département de la culture Urs Wütrich, ce trésor est la plus importante découverte archéologique jamais trouvée en Suisse. "C'est la découverte du siècle", selon lui. Les pièces étaient disséminées sur 50m2, mais elles ont probablement été enterrées ensemble. Les pièces mesurent chacune environ un centimètre de diamètre et pèsent à peine 2 grammes. Ensemble, elles pèsent environ 500 grammes. Les pièces sont exposées temporairement dans un musée de Liestal. La plupart des pièces sont des "quinaires de Kaletedou", inspirés par les monnaies romaines, mais plus petits. Originaires de l'est de la France, ces pièces étaient aussi utilisées sur le le territoire qui forme la Suisse actuellement. Les pièces découvertes à Füllinsdorf ont été enterrées vers 80 ou 70 avant Jésus-Christ. A l'époque, une ville celte se trouvait à l'emplacement de la ville de Bâle. ISRAEL – Ashkelon - First-century rock drawings in the Sinai and more than 700 fifth-century B.C.E. 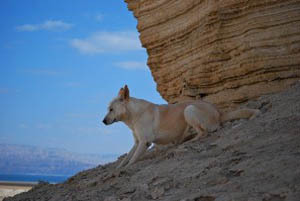 canine skeletons unearthed at the coastal site of Ashkelon* south of Tel Aviv attest to the historical prominence of the Canaan dog, a pointy eared breed that has lived in Israel since Biblical times. The wild breed has faced difficulties over the last few decades due to rabies eradication programs and decreasing numbers of Bedouin camps in the Negev. Sha’ar Hagai Kennels, located outside Jerusalem, collected and bred desert dogs to keep the Biblical breed from becoming too thoroughly inbred, but when the kennel received an unexpected eviction notice from the Israeli government, the dogs’ future grew grim. An online petition is raising awareness to protect Israel’s official breed, but a court decision could mark the end of an effort to sustain the ancient pedigree. 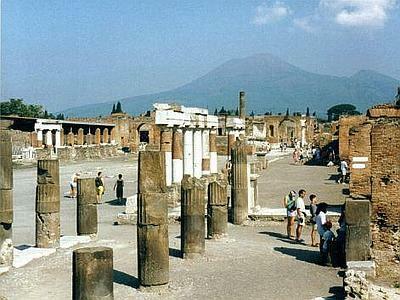 ITALIE – Pompeii - The European Union has given the green light to a plan to join forces with Italy to jointly spend 105 million euros to keep Pompeii from crumbling. "We gave our approval to this important restoration work that is not only in the interest of Italy, but for all of Europe's historic patrimony," said European Union Commissioner for Regional Policy, Johannes Hahn, on Thursday. Hahn's commission and Italy from 2000 to 2006 together spent 7.7 million euros on 22 restoration projects at Pompeii. Highly-publicised collapses of ancient buildings at the UNESCO World Heritage site has prompted an outcry that Italy is neglecting the world's largest archaeological site. USA – Plattsburgh - An archaeological dig conducted last summer near Lake Champlain's New York shoreline has uncovered evidence that the site was a winter encampment for American soldiers during the War of 1812. The Press-Republican of Plattsburgh reports (http://bit.ly/H2JfdB ) that archaeologist Timothy Abel says the excavations on property formerly owned by the Plattsburgh Air Force Base unearthed military artifacts such as uniform buttons bearing the number 15, indicating the U.S. Army's 15th Regiment. The regiment spent the winter of 1812-13 encamped at what was known as Pike's Cantonment, named for the camp's commander, Zebulon Pike. The encampment's exact location in Plattsburgh had been debated for decades. More excavations are planned at the site this summer. In September 1814, American land and naval forces defeated the British at the Battle of Plattsburgh. ROYAUME UNI - Caerleon - Injured servicemen helped reveal the remains of a Roman building in Monmouthshire this week. A team of 32 soldiers from the Rifles regiment, together with students from the University of Leicester and veterans, have been working on a dig at Caerleon Army Training Camp since Monday. It’s all part of Operation Nightingale, an army project which uses archaeology to help rehabilitate servicemen. Soldiers, some of whom have suffered double amputations, gunshot wounds, explosions while in vehicles and burns, worked on the site digging trenches and revealing the walls of a Roman building. USA – Pollocksville - Through the gates and down a winding dirt road by the 1824 Foscue Plantation House near here, student archeologists are digging squares and sifting sand to discover more about our colonial past. Digs six and seven years ago unearthed Civil War artifacts near the plantation house itself, but this one continues the search for earlier history tagged in the Foscue Family Papers 1753-1869 that are now in a UNC Chapel Hill Wilson Library collection. Those papers documented life on the Foscue Plantation prior to the 1824 plantation house, which is now restored and open to the public on Thursdays. And the archeological explorations by the ECU and CCC students have literally brought up the bones of some family members and unearthed artifacts that give a clearer picture of the people and the period.